Hello, friends! 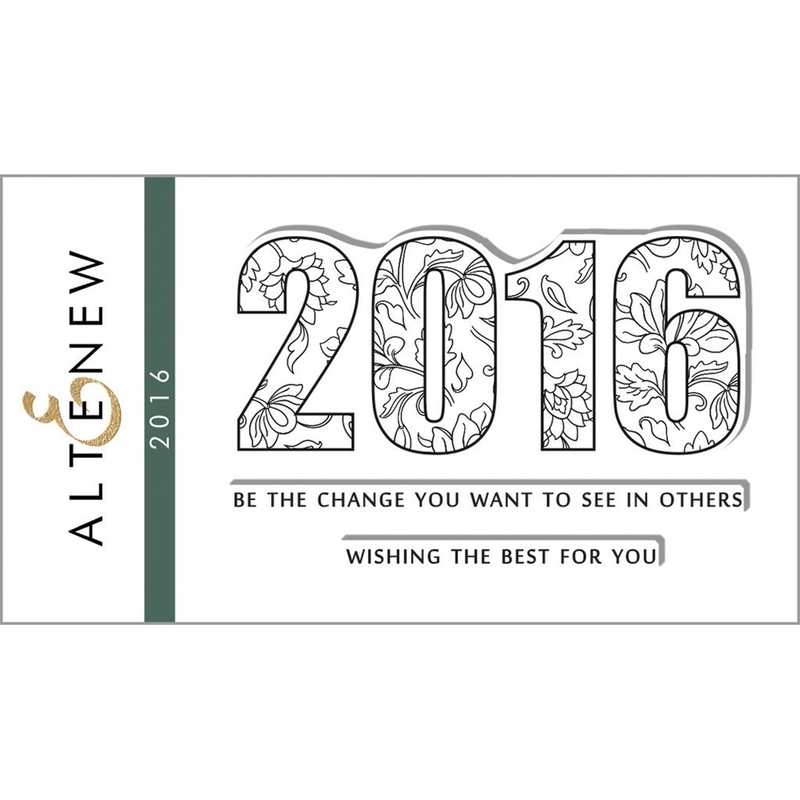 A few days ago Altenew shared their March 2016 release and my favorite part of it were the new mini stamps. 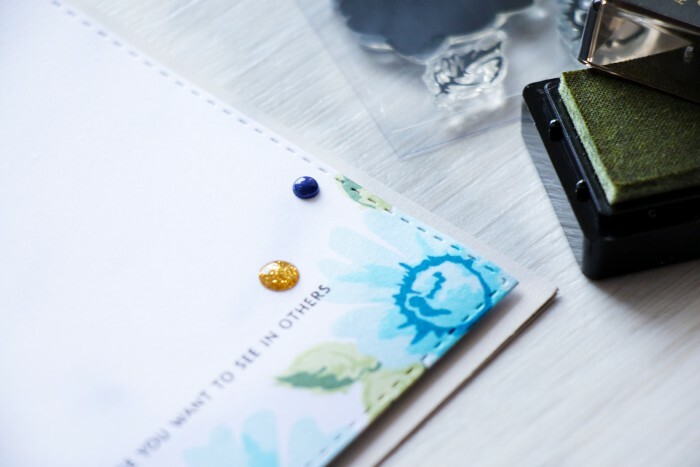 They are very affordable and offer a lot of possibilities for stampers. I have a Clean & Simple card I’d like to share here using 2 mini sets from this release. 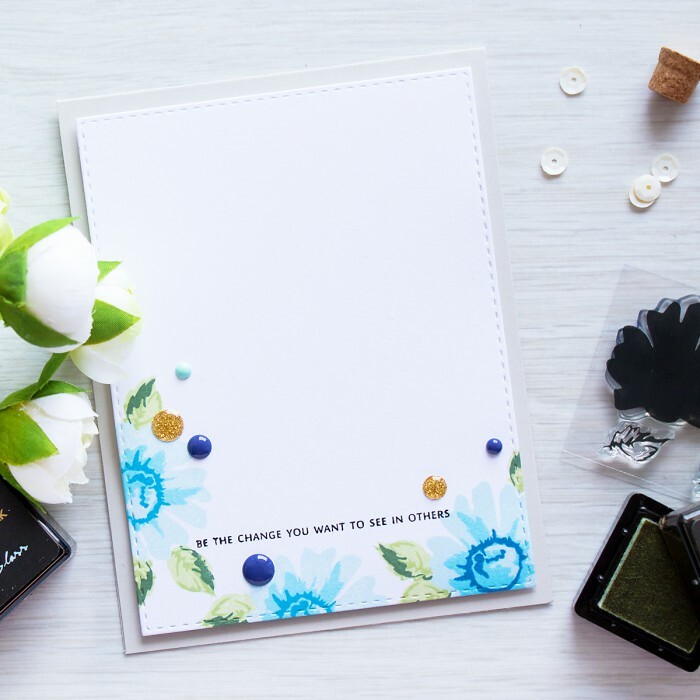 You really don’t need a lot of supplies to create cards. 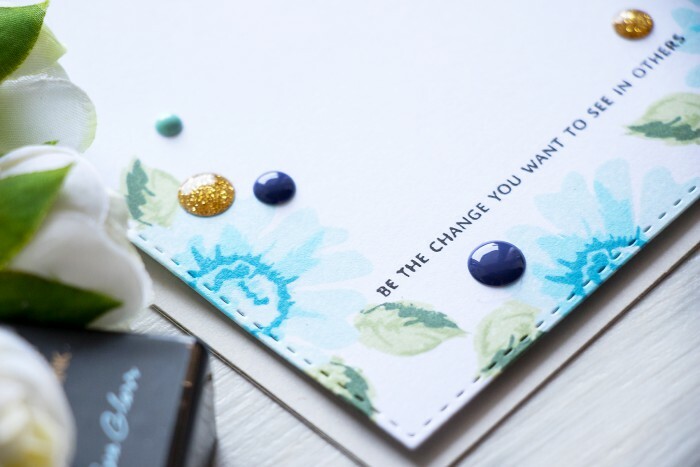 For this project I only used 2 mini stamps, 6 colors of ink, 2 colors of cardstock, one die and a few enamel dots (okay, when I put it like this, it does seem like a lot of supplies, lol). 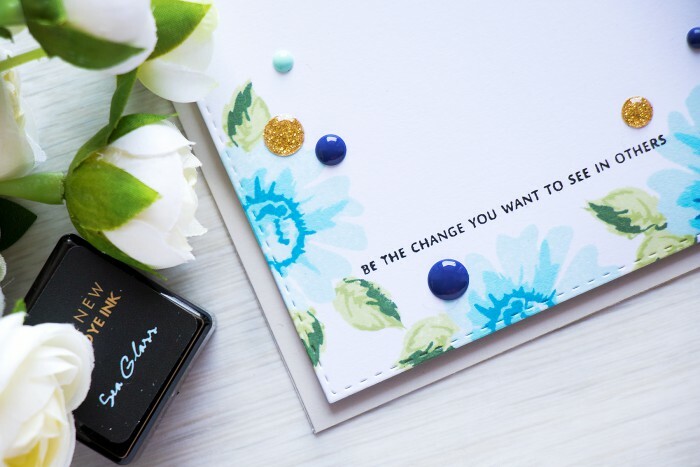 I started by stamping a sentiment – Be The Change You Want to See in Others using VersaFine Onyx Black ink. I love to use quotes like this one on my projects, they always help to create a no-reason every day card. Flower and the leaf images came from the new mini Daisy stamp set (I think its the smallest color layering stamp set out there, so if you are looking to try and see if you like color layering – I highly recommend it, it has a detailed guide on the back of the packaging to help you stamp beautiful images) and were stamped using the following colors: Sea Glass, Ocean Waves, Dusk (for the flower) and Frayed Leaf, Forest Glades, Evergreen (for the leaf). My stamped panel was die cut using a Stitched Rectangle die from Simon and was foam mounted onto a light grey card base. I’ve been enjoying using light grey base for my cards lately, its not too dark, so I don’t need to include a panel on the inside like I did here, but its also not too light, just a perfect color. 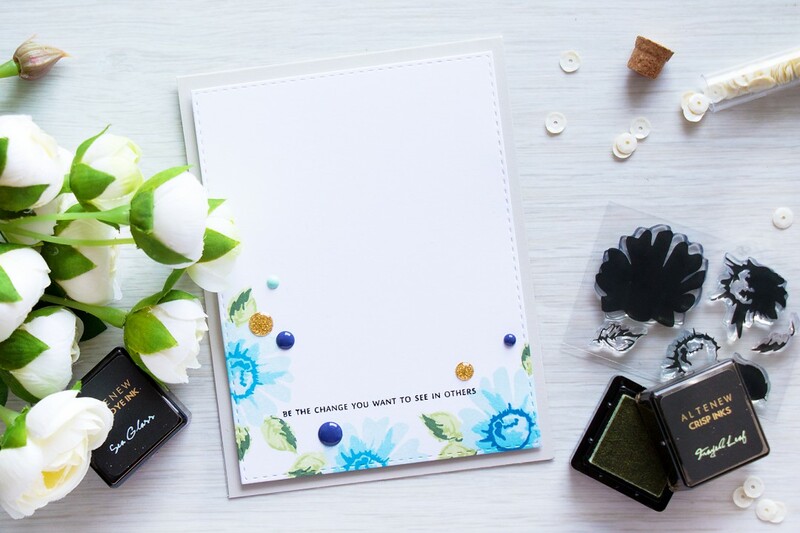 Because this was such a simple card I also added several enamel dots in dark blue, teal and gold glitter as little accents. To tell the truth I wanted to add my favorite clear droplets, but I couldn’t find them on my desk when I was making the card. I DID pin this Yana, it’s beautiful. Would LOVE to see a video on this little beauty sometime. But indeed, in comparison with another card not a lot of supplies were used here to create this gorgeous stunning card!!! It’s a pure beauty! Love colors and simplicity if design. I really love the simplicity of that card! I am going to try to order some of the “few” supplies needed to make!